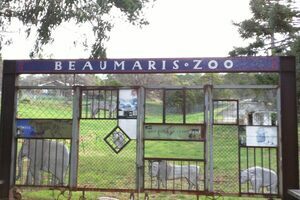 An old-fashioned zoological garden, Hobart Zoo, was originally opened in 1895 as “Beaumaris Zoo” at the private Battery Point residence of socialite Mary Grant Roberts. Though uneducated in animal science, Roberts wrote the manual on the care and breeding of Tasmanian Devils and was hands-on with all her charges, especially her beloved thylacines or Tasmanian tigers. She bought a mother and three cubs to her Zoo in 1909, and a number passed through the gates over the years. After her death in 1921, the family donated the collection of animals to the Hobart City Council. With plans for a new, larger zoo in the works up in grassy Queen’s Domain, new curator Arthur Reid undertook a tour of fact-finding zoos across Australia. The transfer of animals including wallabies, kangaroos, possums, and birds began, and over the years other animals were donated by locals and added to the collection. A grand enclosure for lions was completed too, and the zoo re-opened in 1923. Financial problems saw the zoo close in 1937, just months after the last Tasmanian tiger had died after being accidentally left out in the cold and catching hypothermia. Since its closure, the zoo became a fuel and storage depot for the Australian Navy. Other ideas for the site—including a new zoo—have been suggested over the years, but the site still sits forgotten. The colorful gate now at the site was installed in September 2000 (World Threatened Species Day) and features sad-faced sculptures of those long-gone Tasmanian tigers that once called this zoo home.